Lower: The 7075-T6 forged lower receiver is hard coat anodized, and accepts standard AR-15 fire control groups. The extended magazine release is outside of the trigger guard for safety, which allows for an AK-style release movement but also features oversize side paddles for fingertip release by the trigger finger. The KS-47 G2 receiver also accepts standard AR buffer tubes. The KS-47 G2 lower has steel reinforcements to accept AK style surplus magazines including drum-style. This Gen2 design features a PA-10 carbine buffer spring and heavy H1 buffer to ensure reliable operation with a wide variety of aftermarket and surplus magazines. This lower is finished with a PSA A2 Classic Grip and KAK Industries Shockwave Blade and Buffer Tube. Through extensive testing, we have determined that we can only guarantee the reliability of the KS-47 G2 platform with the PA-10 carbine buffer spring and heavy H1 buffer. The KS-47 G2 Lower will accept most aftermarket fire control groups (Geissele, etc.). However, due to the magazine catch geometry, one piece drop in triggers such as CMC style triggers will not function in KS-47 G2. Upper: The KS-47 G2 upper receiver is precision machined out of forged 7075 T6 aluminum, and then hard coat anodized for durability. While retaining the look of a standard M4 upper, the KS-47 G2 upper is designed to work with the new Gen2 KS-47 lower. The upper features integrated over-insertion tabs to prevent the bolt from dragging on the magazine. This CMV 4150 barrel is chambered in 7.62x39 with a 1 in 10 twist and has a single, large feed ramp to accommodate the larger case diameter of the 7.62x39 round. The barrel is nitride treated for accuracy and durability, and is finished off with a 5/8-24 thread A2-style compensator. The forward assist, dust cover, charging handle, and safety are all standard AR-15, as are the PSA Classic Polymer Handguards. The KS-47 G2 upper will not work with a standard AR-15 lower. 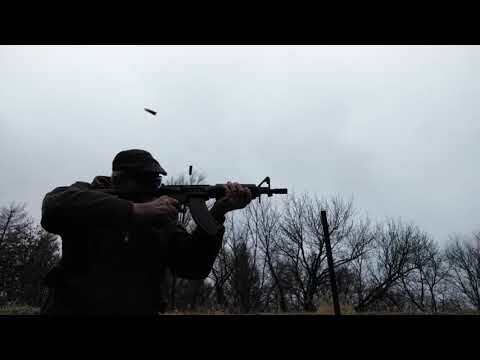 Is it safe and ok to use steel cased ammo like in an AK would, with worrying about damage to the bolt? BEST ANSWER: The bolt is a harder steel than the mild steel used for the casing. The myth of steel case damaging the bolt was debunked a while ago. I live in Colorado, I was wondering if you'd be able to ship this with a lower capacity magazine or no magazine at all? Do you have this in California legal model ? If I want to SBR this, will the buffer spring and buffer fit a standard AR15 buffer tube? Will this pistol accept regular Magpul AK magazines? can I change out the buffer tube and the brace 2 another? BEST ANSWER: Yes, they are standard mil spec parts. As with most Ars the buffer and springs are pretty well tuned from Palmetto for proper cycling. If you change the weights and springs of the buffer tube components it may effect cycling. Yes, I changed mine to a KAK Shockwave 2. But be sure to sure the original spring and buffer to assure proper cycling. Which part do I need to convert this to the m-lok handguard? BEST ANSWER: Depends on handguard. The MagPul drop in MLOK handguards, carbine length, would directly replace the plastic handguards here. No tools required. This was correct. 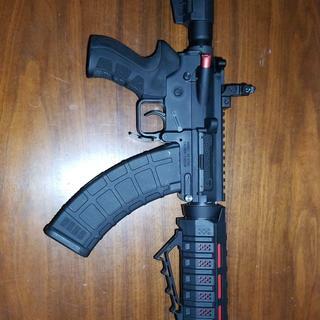 Changed to a MagPul MLOK carbine length handguard. Didn't NEED any tools to change it out but a flathead screwdriver helps get the handguard off if you don't have 3 hands. You will need to consult a qualified gunsmith, because you have to remove a bunch of stuff to get it ready for the free float m-lock ie low profile gas block, barrel nut, hand guard. Will it accept a drop in auto sear? BEST ANSWER: Perhaps, but it WILL NOT accept a "drop-in trigger". Does this model have a triangular handguard end cap or a circular one? BEST ANSWER: I just got it the other day and it is a round end cap. Rule of thumb is carbines have the round, mid-length have the triangular end cap. Round with cuts. I installed a MOE SL on mine. Its tight but looks great. Is this considered a rifle? BEST ANSWER: No, it is considered an AR-15 Variant Pistol. Does the bolt hold open on the last round?? Does this come with any mags? Will an ar15 upper chambered in 7.62x39 fit on the ks47 lower?? BEST ANSWER: NO! NO! NO! You cannot mix and match. the AR-15 uppers are NOT milled to accept the AK mags, and the KS lowers will NOT accept the AR mags. Will a regular ar-15 style low profile gas block fit this? BEST ANSWER: Yes. You may already be aware of this but you will also need to remove the classic hand guard, the FSB, and install a free float hand guard. Will ar15 float tube fit it ? BEST ANSWER: Yes, there should be no issue converting the hand guard to a free float hand guard with the right tools, a low profile gas tube, the free float hand guard of your choosing, and compatible barrel nut. Look up PSA GEN2 KS-47 10.5" CARBINE-LENGTH 7.62X39 NITRIDE 9" LIGHTWEIGHT M-LOK MOE EPT SBA3 PISTOL for a version of this pistol with the free float handguard. Will a Fostech Echo Trigger gen 2 fit in this? How does it run suppressed? I know its not on the approved mag list above. Anyone ever try a croatian bho mag with any luck? Will a promag drum mag work with this model ? Does this use the same bolt carrier and bolt as the models built on an AR type upper/lower? Curious if they've changed these parts for this variant, especially the bolt. Machining a standard AR bolt face to take the larger 762x39 thins the bolt steel out quite a bit. Thanks! 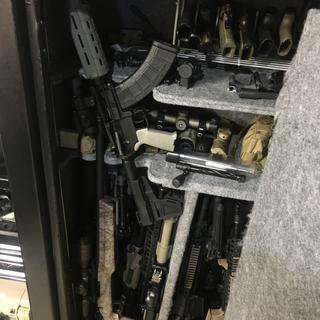 I live in Colorado would I be able to get this the 10-round magazine? Failure to Feed issues and heavy ware on buffer even after sending it in for repair! I got this pistol back In January. Fit and finish were all good. Took it out and ran about 300 rounds of golden bear and wolf through it. Used tested Chinese, Romanian, and Magpul mags, and fired un-supported with nothing touching the mag. About 10% of the time the pistol ejected the fired round and failed to feed the next round. (Round jammed at an upward angle between the chamber and bolt). At the end of shooting, I noticed the charging handle felt very gritty and hard to pull back. 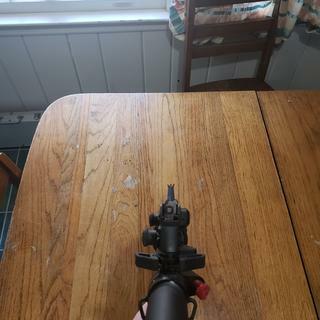 Opened the receiver and found that the end of the charging handle was nearly sheared off where it interfaces with the bolt carrier. Heavy ware on upper receiver and the buffer had an indentation and heavy ware from being battered by the bcg. Lots of aluminum shavings in the bottom of the lower. Sent the pistol back to psa with full written description of the issues I was having. Also told their customer service the same information. They sent it back having just replaced the charging handle and test firing 30rds. (No note in returned pistol about what they found or did, I had to call customer support to inquire). Went out and shot another 200 rounds and still getting about 3 or 4 of the same exact jam (FTF) in every magazine. Talked to customer service and sent it back in. Will wait to get it back for the seccond time and see if they can fix the issue. At this point I would rather get a store credit as I no longer have faith in this platform, but PSA indicated this was unlikely so im stuck with more expense and time lost testing their firearm for them when I get it back. Long time PSA customer, now very disappointed in my purchase. Only complaints is the front sight post being out of alignment from the factory. This seems pretty common from Palmetto State as I have had a few friends with the same issue. My friends was so bad he couldn't get to zero. I was able to get mine zeroed at 100 yards and still have some windage adjustment left. Put strike industries parts though out. Hogue beaver tail grip. Kak micro flash forwarder. Blitzgrieg chevron front post with tritium. The carry handle is Palmetto States. The trigger on this is not as nice as their EPT i got on the carbine rifle. I have yet to have a failure to feed, failure to fire (ive only shot wolf steel ammo), or any failure in general. With the Kak flash forwarder the sound to shooter is less than my 16 carbine with 3 port muzzle brake on it. It has grown on me. At first the lack of a bolt catch or hold open really bothered me. I had to run a couple hundred rounds through it to get used to it. I run mine with a extra power spring and a heavy 9mm Buffer. 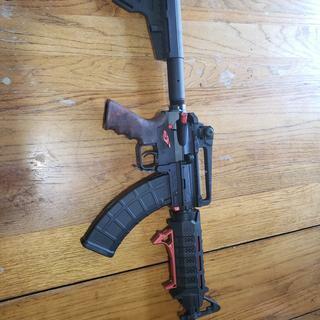 Recoil is a bit stiff but I might try a couple other combinations. .308 spring is ridiculous. Typical PSA fit and finish. Its OK. Switched out the useless blade for CQB stock.Write your review here. It must be at least 20 characters long. Consider whether you would recommend this product and what you like or dislike about it. Well bought the Gen 2 10.5" pistol back in December and just had a chance to take it out for the first time today in February. Fires the first shot and short strokes loading the next round. Either just a click and an empty chamber or it rides the round home causing a jam. Man I was really hyped about this thing. Waiting on customer service now so I can ship it back...hope they get everything worked out. 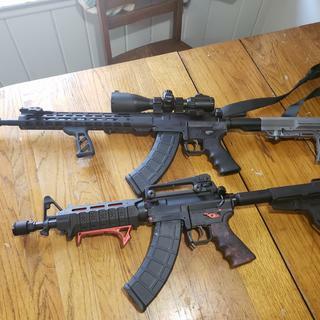 I have ran 250 rounds of Wolf and Tula. Flawless! The heavy buffer tames the recoil and makes cycling perfect. I am shooting sub MOA groups with open sights. 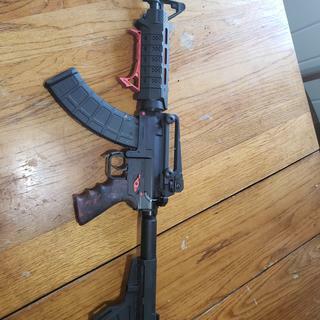 1st AR 7.62x39 I have owned that has no issues. PSA has done their research. Look out piggies, its going to be a fun spring. 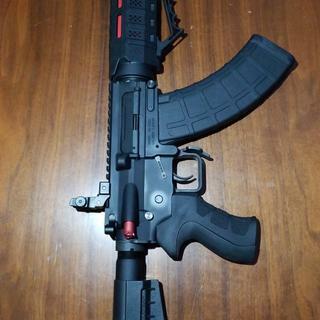 Most Badass AK Hybrid pistol out there!!! Too much fun to shoot! This is now my new favorite gun!!! Has ran terrific so far with a couple hundred rds through it after a easy quality control issue that was missed 😑 First range test I had numberous failure to fire light primer strikes so I checked the firing pin which looked correct & fine. When I got home I figured the only other thing it could be is maybe a weak hammer spring which I was going to replace reguardless with my wolf hammer spring. Upon installing my wolf hammer spring I found the hammer spring wasn't all the way through the receiver, not even into the other side so it wasn't secured & only one side of support which explained the failure to fires. Installed some anti-rotate pins but hammer pin wouldn't go all the way through like the stock ones due to the hole having a burr. Knocked the burr out installed new hammer spring, pins & has not had any issues since, runs great!! !